Have you ever felt like a plain and common caterpillar below a sky of beautiful butterflies? Yet with each day that I put my confidence in Him, I become more confident in myself -even in my personal image identity. My transformation has not been an easy one, but I have found that the things that are hardest for us to learn in life are the things that stick with us the most, and they are the things we need to share. Making people beautiful was not the hard part; I started my life as a cosmetologist long before I ever had any training or licensing. In fact, I was only 11 when I began cutting hair. Makeovers were always a lot of fun because it is truly satisfying to make a friend feel good about herself – even if her confidence seemed to wear off when her hair lost it’s bounce. That was my problem too. I knew how to accentuate any glimpse of beauty I had, yet it seemed that I was painting on a lie as I applied the makeup. When I was given a compliment on my image, I always felt as if the words were really an affirmation that I was good at making up (as in pretending!) my image, and that I had fooled that person into thinking I had any beauty to offer. I believed it didn’t matter much (or at least it shouldn’t) that I had so little beauty; I knew “true beauty is on the inside,” and I pushed all me desires to be lovely into furthering my career. I began my studies on image consulting and “selflessly” gave all my time and effort for others. I quote “selflessly” because in reality, my sacrificial efforts were all about what I did for my friends and clients. It wasn’t so much about how they felt as it was about how good I was at making them feel good. The caterpillar has one mission: to eat and grow. My world was rocked in 1992 when the man I had married, and who’s child I was thrilled to be carrying, left me for other women. I began to shut down and withdraw from life. I needed to tuck away in a cocoon and seek God because everything that mattered to me had suddenly dissolved away. I didn’t know who I was for quite some time, even after finding a wonderful and godly man who loved me unconditionally. I didn’t find my wings until after we faced the unbearable loss of one of our children. 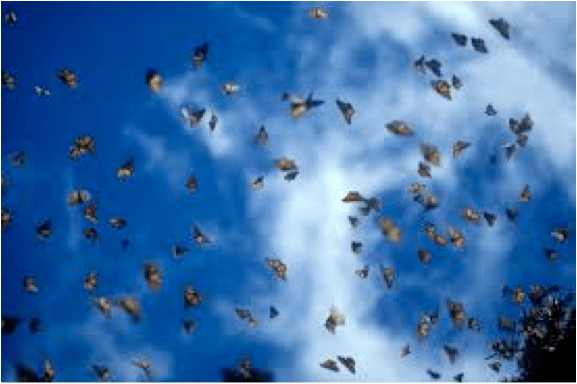 In my grief, I tucked deeper into that cocoon as I learned to completely and utterly rely on the only wise God who is faithful and just and cares more deeply than any friend could. I needed to relinquish my broken spirit to Him before He gave me wings to soar. I like to call this metamorphosis a Supreme MakeOver, because the Supreme Stylist, the One who created me, gave me confidence that was deeper than my outside beauty – which I did find, by the way. My life is no longer lived to eat and grow; I am now liberated to be so much more than a simple caterpillar. I have been given a greater mission: to go and share the beauty of God to anyone who will receive it. A caterpillar does not reproduce; it is too selfish. A butterfly not only reproduces after it’s own kind, but it causes various flowers to reproduce as it carries their pollen from one beautiful blossom to another. A caterpillar has many legs, but is limited to a small territory and often causes others to cringe; butterflies migrate thousands of miles and cause us to sigh with delight at the peace they bring. If you have not yet experienced a Supreme MakeOver, I encourage you to seek after the One who created you. Spend some time tucked in alone with Him and let Him speak to you – surrender to Him everything that you are, and let Him make you new. 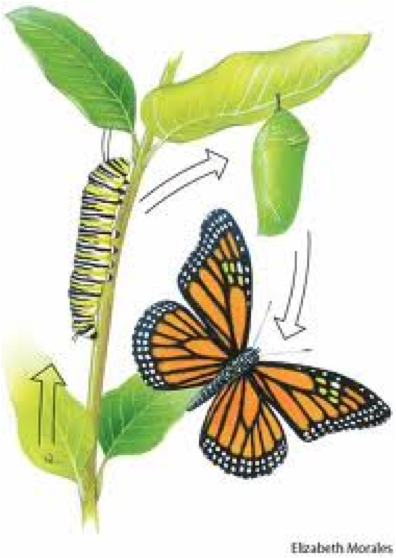 If you find yourself frustrated with your own selfish ways (or perhaps wishing someone else would change… )then I encourage you to be patient and remember that no butterfly would emerge from any cocoon if the caterpillar didn’t first take time eating and growing.